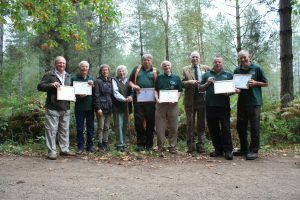 Six woodsmen from the Balcombe Estate, Haywards Heath have received Royal Forestry Society awards in recognition of their combined 248 years of experience and knowledge managing and improving the estate’s 500ha of woodland. Clive Boniface, 63, particularly known for his coppicing of sweet chestnut and thinning plantations. 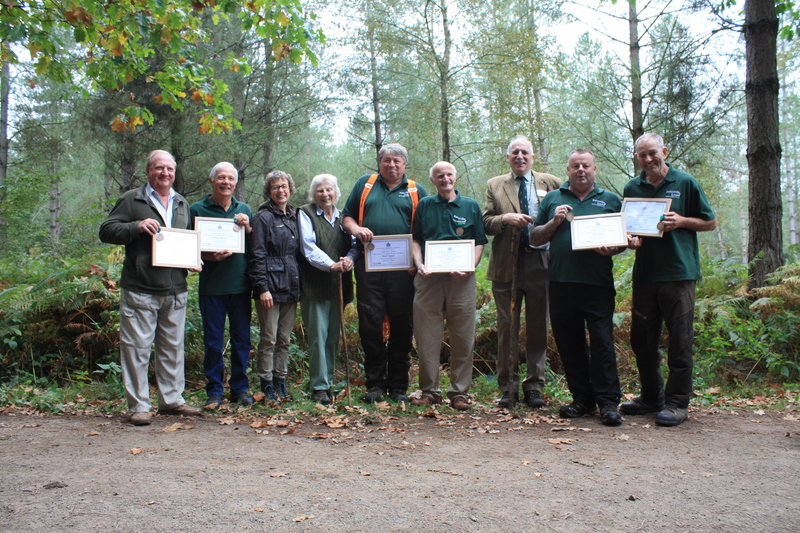 Over the last 44 years he has improved the estate’s woodlands, and his work is second to none. Ernie Fry, 73, has worked in both the woods and the sawmill over the past 40 years, mastering the controls of a timber crane and continuing to extract timber from the woodlands. Russell Law, 53, is the main tractor driver for the forestry department, hauling timber on the MB TRAC, hedgecutting and running the wood chip enterprise. He joined the estate from school as a YTS worker 37 years ago. Sandy Lewis, 75, has worked for the estate for 43 years. He drove the Volvo forwarder in the post-1987 storm clearance operations and controlled grey squirrels until warfarin was removed from forest use. He now prunes Christmas trees and maintains footpaths on the estate. Sandy was the son of the estate’s former head gamekeeper Jack Lewis, and his brother Kendrick was the head forester for 50+ years. Nicholas Martin, 65, received his medal for 43 years’ service. 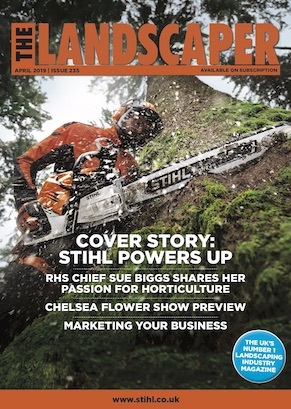 He operated a Hymac/Tapio harvester throughout the clear-up operations after the 1987 storm and is particularly noted for his large hardwood tree felling abilities. A great woodsman, Nick‘ encouraged natural regeneration in many a woodland area by spreading acorns around during his lunch breaks! Mark Napper, 56, is an all rounder whose ability with a brushcutter is second to none, the only thing that slows him down is the machine itself! Phenomenally strong, Mark is your man if you need something pushed, pulled or lifted out of the way! He has worked on the estate for 41 years.